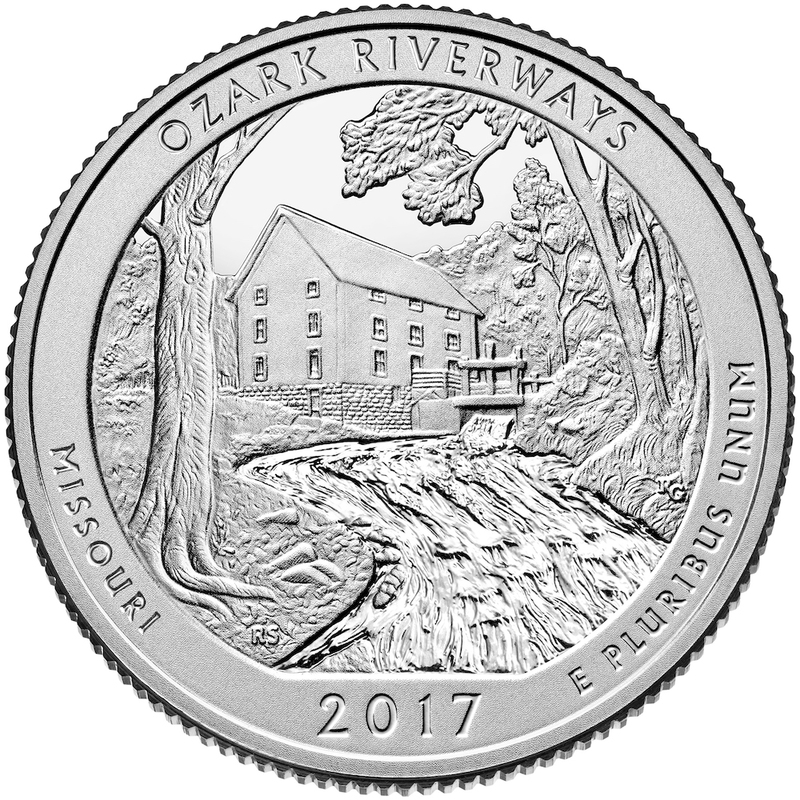 EMINENCE, MO — Representatives of the United States Mint (Mint) and the National Park Service today celebrated the release of the America the Beautiful Quarters® Program Coin honoring Ozark National Scenic Riverways in Missouri. The quarter’s reverse design depicts Alley Mill, a steel roller mill built in 1894. This merchant mill was used to convert wheat into flour. Much of the original milling equipment is still in place, and visitors to the park can tour the mill. “Vital to the community here a century ago, the mill stands as a tribute to our ability to harness the power of the environment and reminds us of a way of life heavily shaped by the remote and rugged landscape in which it endured,” Mint Senior Advisor Michele Satchell told onlookers. Satchell shared the stage with former NASA astronaut Tom Akers, who served as master of ceremonies of the event, while the Baker Family, an award-winning bluegrass band from South Central Missouri, entertained the crowd. Other speakers included Congressman Jason Smith; Patricia Trap, Deputy Regional Director for the National Park Service; Paul Fitzwater, Missouri State Representative, who represented Governor Eric Greitens; Larry Johnson, Superintendent of Ozark National Scenic Riverways; David Stokely, District Director, SW and South Central Missouri, who represented Senator Claire McCaskill; and Caroline Yielding, Field Representative for Southeast Missouri, who represented Senator Roy Blunt. The quarter’s designer Ron Sanders, an artist in the Mint’s Artistic Infusion Program, was also on hand. Ozark National Scenic Riverways is the first national park area to protect a river system. The site encompasses 80,785 acres of unique natural resources, including a world-class spring system that is unparalleled in North America, more than 400 caves, and other special geologic features. The quarter struck in honor of Ozark National Scenic Riverways is the 38th release in the United States Mint America the Beautiful Quarters® Program, a 12-year initiative that honors 56 national parks and other national sites authorized by Public Law 110-456. Each year, the public will see five new national sites depicted on the reverses (tails sides) of the America the Beautiful Quarters. The United States Mint is issuing these quarters in the order in which the national sites were officially established. Products containing Ozark National Scenic Riverways quarters are available for purchase directly from the United States Mint’s online catalog (www.catalog.usmint.gov).